Pour your own beer, new food kiosks and self-serve concession stands are among upgrades and renovations unveiled this week at Capital One Arena downtown. See photos and video. WASHINGTON — Pour your own beer, new food kiosks and self-serve concession stands are among upgrades and renovations unveiled this week at Capital One Arena downtown. Numbers of food stalls have kiosks where you can choose menu options and pay electronically before moving to a window to pick up your order. At a “grab-and-go” location, artificially intelligent check out scanners discern what you’re buying and tally the tab so you can pay electronically. The top-to-bottom renovation wrapped up just in time for the 2018-2019 Washington Capitals’ and Wizards’ seasons. New food options include everything from hot dogs topped with crab dip to cookie dough desserts and healthy Mediterranean greens and grain bowls. 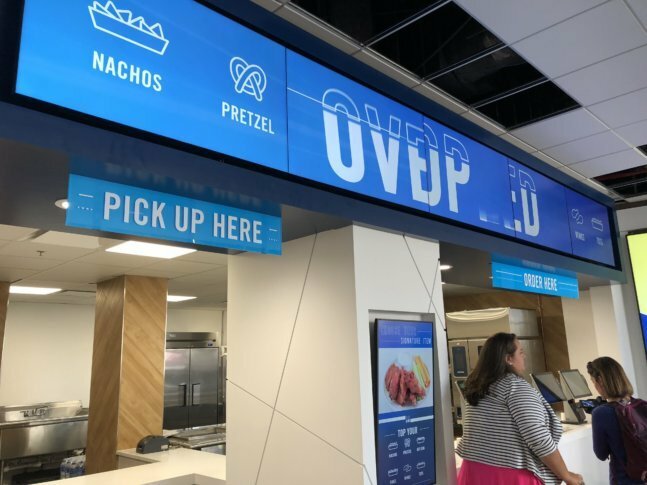 Food stalls can change themes and item options near instantaneously as part of the new digital experience at Capital One Arena. For example, during last season’s hockey playoffs, the menu board at one spot went from Lucky Buns’ hamburgers to “Jane Dough” cookie dough desserts and boozy milkshakes. The $40 million dollars’ worth of upgrades includes a new sound system for sports, events and concerts. Color schemes in the concourses can change as needed. There are new ceilings, floors, TVs, twice the number of phone charging stations and more comfortable seats. “There are the exact same number of seats,” President of Venues for Monumental Sports & Entertainment, David Touhey said. They’re not narrower, no new seats got squeezed in. They just have new fabric and springs. What about the cup holders? Seeing his new stall for the first time during the renovation unveiling this week, the chef and owner of Lucky Buns gushed about how much he enjoys being at Capital One Arena.